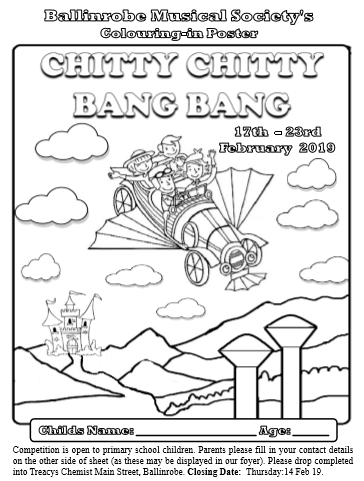 We are delighted to announce that this year we are running….. and we can’t think of better show to announce our FIRST Colouring-in Competition. This competition is open to Primary School Children, and the winner will receive a Family of Four ticket to our Sunday evening show, which is on at 8:00pm on Sunday the 17th Feb 2019. We ask that Parents provide their contact information on the other side (non coloured side) of the poster, as if it permits we will display the posters in our Foyer. Please drop your completed posters into Treacys Pharmacy, Main Street, Ballinrobe. Our Closing Date is Valentines day the 14 Feb 2019 ( so we have enough time before the show to pick winner and to contact them).